After weeks of eager anticipation, it has finally arrived; the 2014 Macau Grand Prix. Considered the most prestigious event in all of junior single-seater racing, this is the one that everyone wants to win – the blue-riband Formula 3 world finale that pitches the very best from all corners of the globe against each other in one unique battle royal. Felix Rosenqvist finds himself on the invitational Macau grid for the fifth consecutive year, as he goes all out in a fully-fledged quest for victory in the Chinese classic behind the wheel of his Kashbet.com by Mücke Motorsport Mercedes. Having finished second back in 2012, and been in the mix again in last year’s edition only to be taken out when jostling for the lead on the opening lap, the Swede has his eyes firmly set on the ultimate prize – particularly as he bids to overcome a troublesome FIA F3 European Championship campaign. With a field spanning 28 of the world’s brightest Formula 1 prospects, however, competition is guaranteed to be absolutely fierce, with race winners from both GP2 and World Series by Renault joining the F3 regulars to set up an unforgettable four days of action. Add arguably the most demanding venue on the planet – the 6.2 km Guia street circuit with its immediate proximity of concrete walls and steel barriers – and the complexity of this Asian motorsport extravaganza is at least beginning to show. Just. Since the first Macau F3 race was staged in 1983, and won by a certain Ayrton Senna, few have managed to truly master the roads of the former Portuguese colony – and even the very best have failed. In perhaps the most telling testimony to the difficulty of the event, a full 15 of the drivers on the 2014 Formula 1 World Championship grid have attempted to win the Macau Grand Prix. None of them ever did (Jenson Button coming closest with second place in 1999). Free practice for the 2014 Macau Grand Prix gets underway on Thursday. Felix Rosenqvist is the sole Swede on the grid, which features a total of 19 different nationalities. The Guia Circuit, as the Macau track is officially known, has been referred to as the greatest challenge on the globe by several current Formula 1 drivers. The unique layout of the venue has played a significant part in establishing the mystique surrounding the Macau Grand Prix, with success here dependent on a mixture of sublime skill, an ability to read on-track situations – and that little bit of luck. The lap is made up entirely of everyday roads in the city centre, and begins with a flat-out section featuring two ultra-fast kinks and two long straights where speeds in excess of 290 km/h can be attained. The first “real” corner – the 90-degree Lisboa Bend – marks an ideal overtaking opportunity, but is also a classic multi-car pile-up spot on the opening lap and a place guaranteed to generate drama throughout the weekend. After Lisboa, the track sweeps uphill into a highly technical mountain section. This part of the lap consists of a sequence of fast and flowing “S” bends, which are all taken at high speed just centimetres from the walls. While there are large chunks of time to be found here, the risks are similarly high, as drivers edge ever-closer – and sometimes beyond – the limit in their pursuit of the perfect line. There is no room for mistakes, and the unforgiving Armco barriers that line the circuit are more than ready to punish even the tiniest loss of concentration. 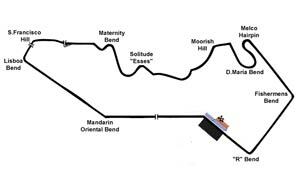 The final part of the mountain section features a series of slower turns, and – of course – the famous Melco hairpin. With a track width of just seven meters, Melco is the tightest corner in the world, necessitating constant yellow flags and a complete ban on overtaking due to the sheer lack of space at the site. In order to enable F3 cars to even negotiate the Melco hairpin, the geometry of the chassis suspension is partly reconstructed specifically for the Macau Grand Prix. The lap then concludes with two analogous right-handers – Fishermen’s and R Bend – before the drivers head out onto the start/finish straight to begin another tour. From a set-up perspective, the complexity of the Guia Circuit provides teams and engineers with a major challenge, as they seek the optimum trade-off between top speed in the first sector and aerodynamic grip around the remaining parts of the lap. The fact that the event is run on regular city streets adds even more difficulty to the cause, in the shape of slippery painted traffic lines and unusual off-camber angles. The Macau Grand Prix is a fully standalone event, and not part of any regular championship. As the world’s most prestigious race on the junior single-seater arena, the list of previous winners includes the likes of Ayrton Senna, David Coulthard, Michael and Ralf Schumacher – and Sweden’s Rickard Rydell. On-track action traditionally gets underway with free practice and qualifying on the Thursday, with Friday activities then mirroring those of the previous day; with another practice session followed by a second qualifying showdown. Each driver’s best lap time from either of the two qualifying sessions then provides him with his position on the grid for Saturday’s Qualification Race. The driver who posts the fastest lap time in qualifying – regardless of whether he does so in the Thursday or Friday session – thus starts from pole position on the Saturday. The outcome of the Qualification Race – in itself a unique feature exclusive to the Macau Grand Prix – is then used to set up the grid for Sunday’s all-important finale. The first driver to cross the line in the Qualification Race secures himself pole position, second place in the Qualification Race equals second place on the Sunday grid, third equals third, etc. The Qualification Race results have no other bearing but to decide the starting order for the main race, which is then run over 15 laps with the winner taking honours in the 2014 Suncity Group Formula 3 Macau Grand Prix. Macau Grand Prix 2014 – full entry list. Want to learn more about the drivers on the grid? Click here.